Large custom made mirrors are prized for their ability to create the illusion of more expansive living space. By reflecting natural light, a large mirrored surface can add depth to living spaces. This makes large mirrors a staple design choice for bathroom vanity areas. However, large mirrors aren’t just used by Toronto homeowners to decorate bathrooms and wash closets. The psychological benefits of large mirrored surfaces can be profound. In modern condominiums, a large mirror is often used to cover a full living or bedroom wall area. Rooms subsequently appear much larger. Small living spaces double in perceptive size and by adding depth, equip living areas with a lighter, more relaxing ambiance. Every room needs an identifiable focal point. Traditionally, hearths and mantelpieces have served as the centerpieces for living areas. However, as home heating and architecture has evolved, traditional hearths have been largely replaced by home entertainment systems. To add more character to Toronto homes, large mirrors can be used in place of entertainment systems. When custom designed, mirrors can be cut to fit precise wall areas and custom frames. Glass will then immediately catch the eye. Moreover, this why a large mirror will often be used as the focal point of a hotel or commercial building foyer. Ceiling and wall mirrors don’t just increase the perceptive depth of living spaces. By being reflective, a well-positioned large mirror can increase the brightness of a room. In this way, large mirrors can be used to brighten poorly lit areas without adding separate light sources. Large mirrored surfaces are synonymous with contemporary bathroom design. 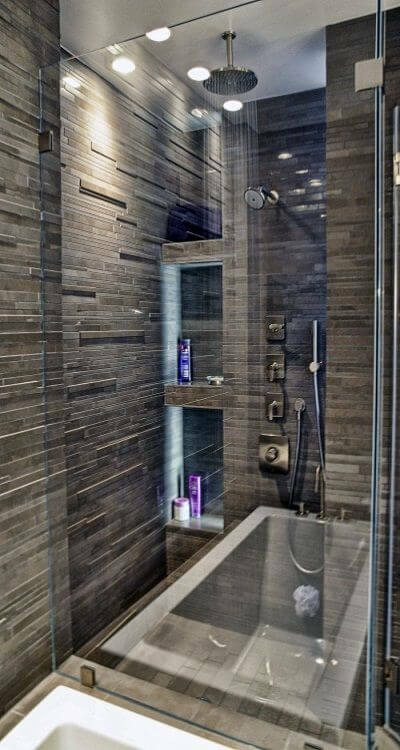 This is thanks to how a large mirror can perfectly complement frameless glass shower and bath enclosures. However, large custom mirrors aren’t just ideal for bathrooms. A large mirror can completely transform the visual aesthetic of a Toronto home. However, fabrication and installation needs to take into account home safety. Catering for Toronto homeowners and businesses, 808 Glass are large mirror and frameless glass fabrication experts. As well as custom mirrors, we design, manufacture, and install, frameless glass bathing enclosures, railings, and wall panels. As a result, we’re go-to experts in Toronto for all your residential and commercial glass needs. As go-to mirror aficionados in Toronto, we can tailor large mirror installations to any size and any architectural design preference. Mirrors are prized in Feng Shui for their ability to direct positive energy. This being the case, to revitalize the aesthetic dynamic of your home, make sure to reach out today to see how we can help.